I decided to use GooglePicasa to store all photos there and you can see the complete album here. 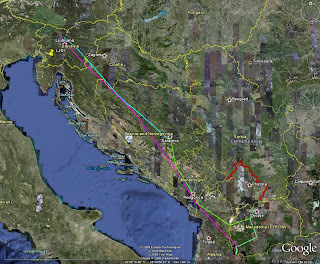 This time I planned another routing to fly to Ohrid (LWOH) and Skopje (LWSK). Due to international flight outside Schengen area I have chosen Ljubljana airport (LJLJ) as my departure airport. The planned route was a very straight one as one can see from the route picture: LJLJ – S3 – NEMEK – NIVES – IDASI – GAC – PERAN – NIK – POD – RETRA – DOBAR – LWOH. The patches of the morning fog on the day of the departure, which was 8.6.2009, delayed the planned departure for 1 hour and 40 minutes. Finally I got the departure clearance and was able to take off. After exiting Ljubljana’s CTR at S3 point I climbed to 5000 feet inbound NEMEK point at the border with Croatia. Soon after crossing NEMEK point I got a request from ATC to climb to FL100 to be reached at NIVES point as this is the minimum altitude to fly in Bosnia in controlled airspace. I was quite happy with this request as I was able to fly higher where the fuel consumption is lower. The request came just in time and I reached FL100 just at NIVES point. The control over the airspace of the west part of Bosnia is delegated to Zagreb control. After passing IDASI intersection point I switched to Sarajevo radar. After reaching GAC NDB we entered in Montenegro airspace and got immediate clearance direct to RETRA point at Albanian border. RETRA is located in the area of Skadar lake and one can enjoy beautiful sight of this lake which is a birds heaven. Before RETRA point I was passed to Tirana radar and got immediate clearance direct to DOBAR point at Macedonian border which is quite close to Ohrid (LWOH) airport. Officially there is no ATS route published between RETRA and DOBAR point, however the Albanian ATC gave me the direct to DOBAR point located close to Debar town. Also this time I got an aleternate frequency in case of loosing connection and this time this was frequency for Ohrid approach. Of course it happened again that I lost contact with Tirana after entering the mountainous terrain close to Macedonian border. Close to DOBAR point I called Ohrid approach and the quality was very poor so I delayed my descent from FL100 to 6000 feet overhead LWOH airfield until I crossed all the mountains towards Ohrid Lake. It was really a joy to fly at FL100 all the way from Croatian-Bosnian border to Macedonian border without any disturbance and with minimal communication with ATC. Again this time I found that a good flight plan which is routed according to the published low level ATS routes works perfectly and controllers give you shortcuts if there is no traffic. I asked Ohrid approach to perform simulated ILS approach which starts at OHR VOR at 6000 feet and goes to the south over lake where you perform a procedural turn and intercept the localizer. It was again a great joy to fly over the beautiful Ohrid Lake and sharpen the skill of flying ILS approaches although I am not IFR rated. I do this solely for a hypothetical case that I would have to perform an ILS approach in case of emergency. Nikola, a friend of my neighbor Stane Omejc, who was traveling with me, was waiting for us at Ohrid airport and took us to his hotel at the coast of beautiful Ohrid lake just outside Ohrid town. In the evening we visited on of the famous Ohrid restaurants and had a great time there. Next morning we started early in direction to Skopje sport airfield Stenkovec where my friends from Aeoro club Skopje were waiting for us. 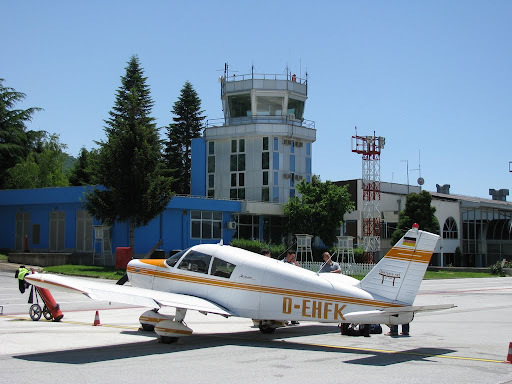 Unfortunately we had to divert a little bit from the planned route due to incoming IFR traffic to Ohrid so we had to fly to Prilep NDB (PEP) and then were cleared to proceed to BUREK intersection and from thereto Stenkovec. I arranged my business meeting for the following morning so we were able to proceed with rented car to Strumica, a small city in the southeast part of Macedonia. Stane was spent almost year and half in army there 25 years ago and had strong wish to see the barracks again. On the way there I took some photos near Štip and Veles. We had late lunch in one small restaurant with excellent grill and for a small amount of money we got so much food that we could not eat it. As we were already close to border with Greece I wanted to see the Dojran lake which partly belongs to Macedonia, partly to Greece. There we watched some local people catching frogs the same way as people usually to fishing. Next morning we had wake up early as I had an early meeting with my customer. After that meeting we left in a hurry to Stenkovec and immediately proceeded to LWSK to clear border formalities and leave Macedonia. Unfortunately we arrived so late that we had to wait almost additional 60 minutes that the military air-show has passed and we were cleared for takeoff. The route back was : LWSK – MAVAR – RETRA – POD – NIK – PERAN – GAC – KUTAK – LQSA. The flight was completely un-eventful with cloudless weather and only few to scattered clouds in Bosnia. We climbed to FL100 inbound MAVAR point and maintained this level until we started final descend to Sarajevo. Also on way back we got a direct shortcut from RETRA point to KUTAK where we handed to Sarajevo approach. We made pretty steep descend and straight in approach to runway 30 at LQSA. Here again I had a meeting with one of my customers and after eating excellent traditional Bosnian food “čevapčiči” with “kajmak” at the old bazaar in Sarajevo, called “Baščaršija” we returned to the airport and started with last part of the route back to Ljubljana. After minor waiting at the holding point of runway 30 we got the takeoff clearance and started climb to FL100. Immediately after departure we were handed to Sarajevo radar and later on to Zagreb control. The planned route was: LQSA – NIVES – LETLI – S1 – S3 – LJLJ. When we were still over Bosnian territory we got a direct clearance to DOL, a VOR near Ljubljana airport. Later on, when I was already in contact with Ljubljana approach, they informed me to expect vectors for ILS approach to Ljubljana airport. Obviously ATC decided to treat us as IFR traffic and of course I didn’t protest. It was a nice opportunity to intercept localizer at 9000 feet and minutes later also the glide slope and perform simulated ILS approach in excellent VFR conditions.